A source told MMAFullContact that all three judges were tested following the decision which failed to convince a number of the mixed martial arts community. “Word has it that all three judges were approached by USADA following the bout in Liverpool,” the anonymous source close to USADA said. “Two were requested to supply on-the-spot samples, with the third running back into the Echo Arena and hiding under the Octagon, Jon Jones style. We asked the source if they could confirm what substances the judges had tested positive for, but unfortunately, we could not ascertain what they were. “How? How the f**k can three judges award the fight to Till off the back of a performance where he basically did nothing aside from drop Thompson,” he said. “Even that was like dubious. I have this theory that the noise the fans made in Liverpool – those loud, obnoxious and crazy Scousers – is what caused Stephen to fall over. Social media lit up following the official decision, which many labeled as a “robbery” (which, if true, would have represented the second instance of Thompson being robbed this week). While the fight was, even objectively, closer than the decision reflects, conspiracy theorists and people who can think for themselves alike had pointed out that the UFC had more interest in Till winning the bout. Controversial circumstances, maybe, but a robbery? While Darren Till will now be in place to fight the winner of Rafael dos Anjos and Colby Covington – which is being fought for the interim-welterweight title – some believe that he will likely earn a shot a Tyron Woodley following the champion’s return to action sometime later this year. Till, who initially missed the 170-pound weight limit for the fight against Thompson, was allowed to weigh in without the media present on Sunday. 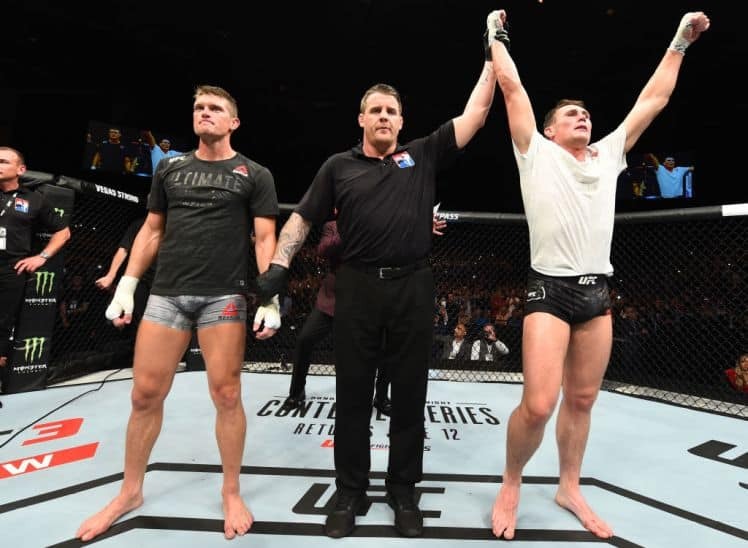 Fans of Till will be no doubt delighted that he has a victory over one of the very best in the welterweight division, but followers of the American will be distraught at the decision. For now, the decision is final and the UFC has a potential cash cow/genuine prospect to tout to the British public, once Michael Bisping hangs up his gloves in the not-too-distant future. Till does have the skills to go far in the UFC, but given his problems with weight-cutting before this bout, Dana White will in no doubt be worried about the Englishman going forward. Following his victory, Till’s previous comments may come back to haunt him, however.